The Livelihoods Funds, impact investment funds that aim at building more resilient communities, ecosystems and businesses, are supported by 12 companies: Crédit Agricole, Danone, Firmenich, Groupe Caisse de Dépôts, Hermès, La Poste, Mars, Inc., Michelin, SAP, Schneider Electric, Veolia and Voyageurs du Monde. The Livelihoods Funds build coalitions with NGOs, public and private organizations and the civil society to scale up impact for the most vulnerable communities while mutualizing investment risks. Since 2011, the Livelihoods Funds have invested or committed € 220 million and their projects aim at improving the lives of around 5,5 million people in the coming years (with already 1,5+ million beneficiaries). How can this “hybrid” investment model achieve significant levels and impacts, while taking into account the interests of communities, public and private institutions, NGOs and companies? Discover the levers which enable the Livelihoods Funds’ investment model to deliver tangible results since 2011. Over the past 10 years, the Livelihoods Funds have developed a robust investment model delivering positive returns and large-scale impact. Together with the best local project developers, our projects are designed and implemented with a focus on costs and efficiency, and we have been able to consistently deliver results at competitive costs. Investment is phased and results-based to control risks and projects costs / revenues are built to deliver a margin at project level and a positive IRR at fund level. Risk management and a cautious approach to unexpected events are also integrated in our strong investment practice. Livelihoods Funds rely on the experience of Livelihoods Venture, the social business that advises the funds, to develop impactful projects. Livelihoods Venture has 20 staff members with senior expertise across a diverse range of fields: private equity funds, developing countries, multi-stakeholder coalitions, agronomy… Its team works closely with project partners- NGOs, business partners, public organizations, financial institutions, academics… – to come up with the most impactful projects. The long-term commitment of the investors in the funds gives Livelihoods Venture the necessary visibility to conduct the monitoring of the projects throughout their lifespan of up to 20 years in the best possible conditions. Livelihoods Funds support non-bankable communities in sensitive geographies. To maximize impact while minimizing investment risks, the funds invest in different types of large-scale projects in various countries. For example, the Livelihoods Carbon Funds invest in mangrove restoration, local energy, agroforestry and sustainable agriculture across Africa, Asia and Latin America. 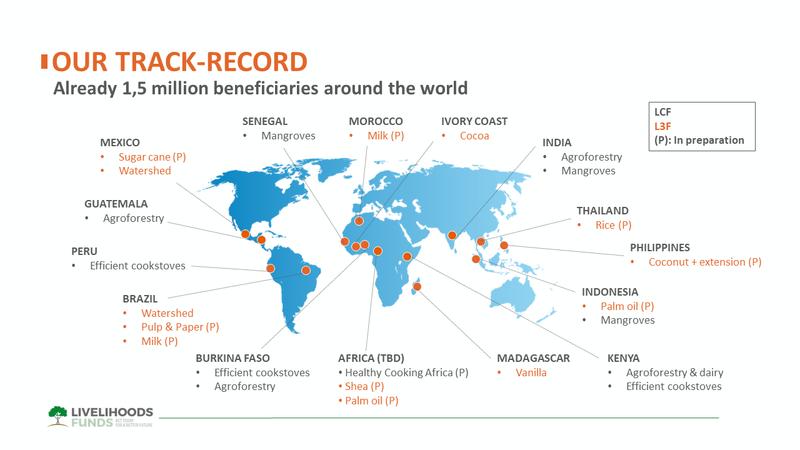 The Livelihoods Fund for Family Farming invests in vanilla in Madagascar, in coconut in the Philippines, in watershed preservation in Brazil… And by implementing large-scale projects, the funds can optimize the investment to reach a large number of beneficiaries. Livelihoods Funds work as a cooperative where investors mutualize risks to reach an excellent cost- impact ratio. By leveraging simple, affordable and replicable solutions and building on community bonds, the funds’ projects can efficiently reach tens of thousands of people in a very short time with budgets perfectly under control. For example, the Livelihoods Carbon Fund has consistently been able to deliver carbon offsets to its investors at a cost below market price since its inception. Within Livelihoods Funds, projects are decided and owned by the investors. Whether it is to generate impact through the carbon economy or by transforming agricultural supply chains with smallholder farmers, investors are fully associated to all decisions regarding the selection of projects, their implementation and monitoring. They have a full sense of ownership of projects and use them to communicate on their sustainability journey.